If you are like me and use Photoshop to save images for your website, then you have seen Photoshop’s jpeg quality settings. The basic idea with these setting is that the higher the setting, the better the image quality and the lower the setting the lower the quality. Along with the image quality is the file size. The higher the setting also means a larger file size and lower the setting means a smaller file size. The balance is to have the best image quality with the lowest possible file size. So a common practice, and one I have used over the years, was to go with a middle-of-the-road setting of 50. That way you got good image quality without having a file that was large and made your site load slow. I recently came across this great article from Sergey Chikuyonok that I wanted to share called “Clever JPEG Optimization Techniques“. 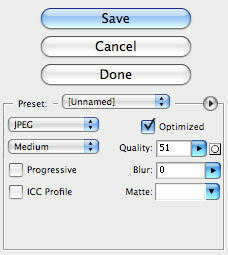 The thing that stood out for me in this article was when Sergey wrote that when you save an image in Photoshop under 50, it uses an additional optimization algorithm, so if you are saving an image that has small, high-contrast details it is better to set the quality setting to at least 51. In the article, there are some images to show you the difference between that 50 and 51 quality setting. You will be surprised at the difference.